Blue Diamond donated a night for guests staying 3 nights and reservation 21 days in advance, the promotion shall be ended on December 31, 2014. For booking from Feb 8, 2015 to Feb 28, 2015 the room rate is discounted 45 %. Apart from head establishment, Blue Diamond has another branch Blue Diamond Signature located on Thai Van Lung where a lot of Japanese customers concentrate and it is about 300 meters from the Opera house. Although it has just been put into operation, the system of Blue Diamond has been received a number of awards in terms of services from Agoda, Tripadvisor, AsiaRooms and Fairway Magazine. Guests staying at the Blue Diamond are served free breakfasts with a variety of Asian and European dishes. 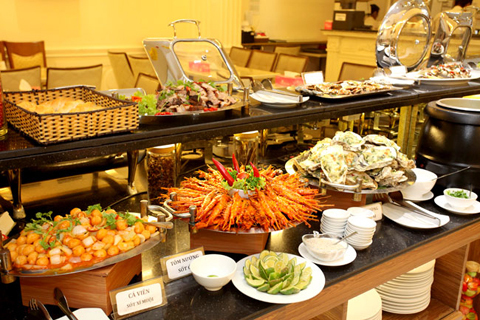 In addition, customers also have the opportunity to experience more than 34 lunch buffet dishes, including appetizers (West Lake shrimp cake, cola seafood, fried bread, etc. ); fries, baked (shrimp grilled with salt and chilli, scallops grilled onion, balut in tamarind sauce, grilled chicken with salt and chilli, etc. ); noodle soups, noodles, etc. All dishes are cooked by head chef Nguyen Thi Thinh with 30- year experience. 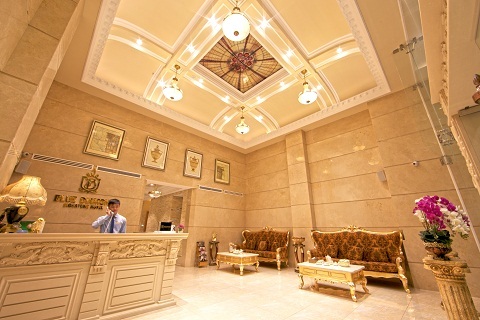 The hotel system of Blue Diamond is equipped with gym; massage service, etc. Contact address: Blue Diamond number 48-50 Thu Khoa Huan street, Ben Thanh ward, district 1 and Blue Diamond Signature number 11 Thai Van Lung street, Ben Nghe ward, district 1.